It’s that time of year when eager shoppers start looking for promising Black Friday and Cyber Monday deals to kick off holiday shopping. Unfortunately, hackers, scammers, and identity thieves are gearing up for the flood of online shoppers too. Shopping on a fake website could result in your personal or financial information being stolen or your device becoming infected with a virus or malware. Knowing how to spot red flags is crucial but simple once you know what to look for. We’ve got tips, tricks, and tools for checking a website’s legitimacy below. The first thing you want to look for on a website is the https:// at the beginning of the address. The S in https:// stands for secure and indicates that the website uses encryption to transfer data, protecting it from hackers. If a website uses http:// (no S), that doesn’t guarantee that a website is a scam, but it’s something to watch for. To be on the safe side, you should never enter personal information into a site beginning with http://. Some internet browsers, like Google Chrome, lend a hand in warning you about unsecured websites. When a site is secure, you may see a small padlock next to the web address, or the address may be highlighted in green. You might also notice the domain name next to the padlock before the https://. That means the website has one of the highest levels of encryption and can be trusted. If you’re unsure, you can click on the padlock or “Not secure” notice to see more details about the website’s security. You can also check up on a site through Google’s safe site search. The presence of the https:// doesn’t guarantee security, but it’s a good starting point. Don’t be fooled by fake logos. Check sites for logos that indicate which security certifications a website has, like DigiCert, Verisign, or Symantec, for example. A scam site may copy and paste pictures of these logos on their sites. To check whether a certification is valid, click on the logo to see if it opens a new tab with details about the website’s security. If the logo is just a picture and not a button, it’s likely fake. 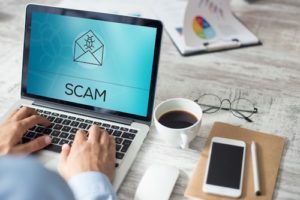 A favorite trick of scammers is to create websites with addresses that mimic those of large brands or companies, like Yah00.com or Amaz0n.net. Scammers count on you skimming over the address and domain name, so it’s always worth double-checking the address bar if you’re redirected to a website from another page. Scammers know that more people will be shopping online during the holidays than usual, so they put together real-looking websites very quickly around those times. By checking the domain age, you can see how long the website has been in business, giving you a better sense of its veracity. The Whois Lookup domain tracker gives you information about who a domain name is registered to, where they are, and how long the website has been active. An excess of spelling, punctuation, capitalization, and grammar mistakes could indicate that a website went up quickly. Companies with legitimate websites may certainly have the occasional typo but still put effort into presenting a professional website. If a website capitalizes every other word or has a lot of odd phrasing and punctuation, take a closer look. Look for several ways to contact the company (phone, email, live chat, physical address) and try them out. Does anyone ever answer the phone? Do you get a generic prerecorded voicemail or form email? If the only method of contact is an online email form, proceed with caution. I once found a series of similar websites that all used the same “live” chat that generated generic responses instead of actually answering my questions. It was a huge tip-off that none of the sites were legit. Look at what else is on the site. Shopping websites should offer standard payment options, such as credit cards or PayPal. If a website requires you to use a wire transfer, money order, or other unsecured (and nonrefundable) form of payment, we recommend staying away, even if the rest of the website looks legitimate. Sometimes retailers heavily discount older merchandise to offload excess goods or make room for new products, but if you find a site that has the latest iPad model listed at an 80% discount, walk away. Chances are high that you‘ll never see the goods you purchase or the money you spent. The best way to protect yourself against malicious websites is to install antivirus software on all your devices and to keep it up to date. Be wary of links sent through emails and texts from retailers, people you don’t know, or even your bank or internet provider, especially if they ask you to confirm you financial or personal details. These are common tactics scammers use to attempt to steal your information or infect your device. A quick online search of reviews of a website will tell you a lot. You can research the reputation of the seller through the Better Business Bureau and other official review sites. If there aren’t any customer reviews anywhere, that’s a concern. If you find large numbers of negative reviews, that’s a clear signal to walk away. Each of these services offers another way to keep an eye on your personal and financial information. Online shopping can be a great and harmless experience as long as you watch out for these red flags and use some caution and common sense. Instead of feeling threatened by all the ways fake websites could fool you, realize that by knowing what to look for, you’re empowered to take control of your online experience. For more help navigating Black Friday and Cyber Monday, sign up for our newsletter.